November 26th, 2018 – Melania Trump has done what every other First Lady at The White House does when the holiday season rolls around: she’s decorated for Christmas. This administration has repeatedly proven, however, that they do things a little differently. 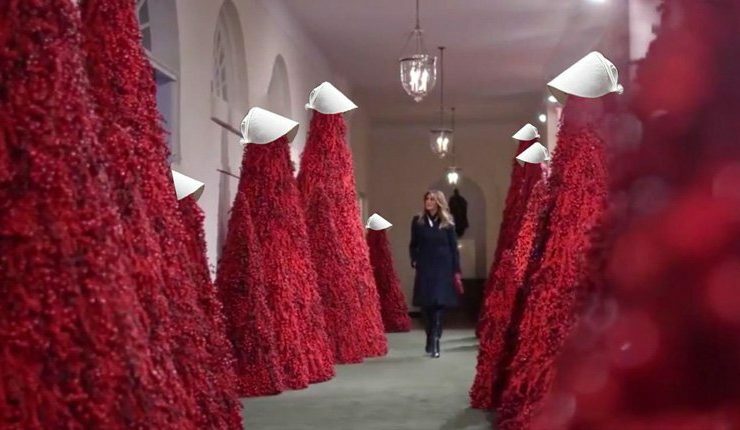 Mrs. Trump posted a video of the new decorations, and while there was some traditional seasonal spectacle, people couldn’t help but mock the blood red trees reminiscent of The Handmaid’s Tale. “The People’s House @WhiteHouse is ready to celebrate Christmas and the holiday season!” she tweeted this morning. While the “People’s House” was ready to celebrate, the people of Twitter were ready to roast. The main focus was how the decor channeled Hulu’s dystopian hit, but other people also saw a connection to The Shining and Carrie. Mrs. Trump caused some holiday laughs last year, as well, but the jokes seemed to have a lot more layers in 2018. Aside from the ominous blood red trees, people loved that the First Lady remembered to promote her “Be Best” initiative. Ornaments with the phrase, ironically meant to combat bullying, are found on the trees and a wreath was made with “Be Best” pencils. People also highlighted the difference in tone and camaraderie between the Trumps and the Obamas by sharing photos of celebrations from past years. And to really put you in the Christmas spirit, others reminded the First Lady that the blood red trees made people think about the children her husband separated from their parents this summer and the ones tear gassed yesterday as they tried to claim asylum.